There are a number of good weather satellite images on the web, which will give you a pretty good idea of the local weather in the region and track any storms that may be threatening our shores. Phuket doesn't really get storms, though. Tropical cyclones affect the western Pacific ocean and sometimes reach as far west as Cambodia. Only one time since I have lived here (8 years) has a storm looked like reaching Thailand, which was called Muifa, back in November 2004. It turned North just before reaching us. 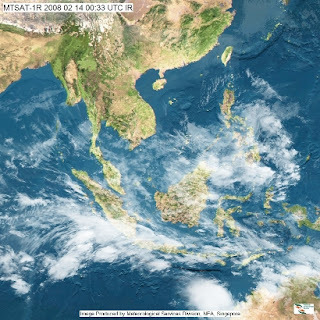 (above) Todays Satellite Image - yes, it's sunny in Phuket. Happy Valentines Day.